Have you ever had a problem that kept re-occurring? Having to address a problem or failure mode more than once is time consuming and a waste of valuable resources. The issue is that the root cause is not being identified or addressed. If you are not getting to the root cause then you are merely treating a symptom of the problem. In addition, if a permanent solution is not determined and implemented, the problem will eventually repeat. There is a simple to use tool that can help eliminate repeat problems. This tool is the 5 Why and 5 How. 5 Why and 5 How was developed in the 1930s by Mr. Sakichi Toyoda. Mr. Toyoda is the founder of Toyota Industries and is said to be one of the fathers of Japan’s industrial revolution. This technique gained popularity during the 1970s and it is still used by Toyota and may other companies and organizations today. The 5 Why method is simply asking the question “Why” enough times until you get past all the symptoms of a problem and down to the root cause. The 5 Why method is often used during the Analyze phase of the DMAIC process and the Plan phase of PDCA activities. It is often used in coordination with other analysis tools such as the Cause and Effect Diagram but can also be used as a standalone tool. 5 Why is most effective when the answers come from people who have hands-on experience of the process being examined. By repeating the question “Why” you can drive down to the root cause of the problem. The 5 Hows are then used to determine a root or permanent solution to the “root cause (s)” of the problem. The 5 Whys and 5 Hows have also been described as being like a ladder. 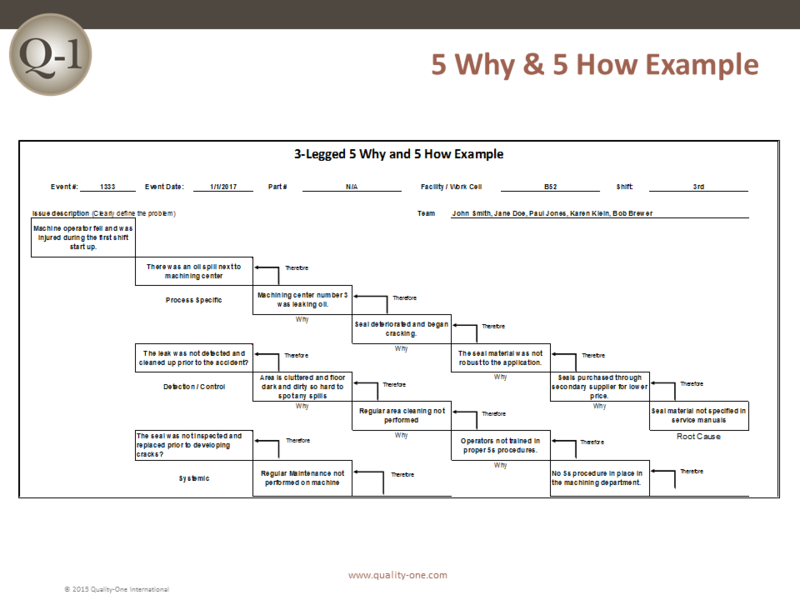 You move down the ladder using the 5 Whys, to drive down to the root cause and then climb up the ladder using the 5 Hows to get to a resolution to the problem. The team will review “Why” did the problem occur and “How” can it be resolved so it does not occur again. The 5 Why & 5 How exercise should be performed by a Cross Functional Team (CFT). It should not be done alone at your desk. The team should include representatives familiar with the process in question along with members from Quality, Process Engineering and operators from different shifts or from the next step in the process. Each team member will bring their own unique viewpoint of the problem and ask important questions that may not otherwise have been asked. The first thing any team should do during a root cause investigation is to clearly define the problem. Develop a clear and concise problem statement. The team should keep their focus on the process and not on the personnel. The team should also determine the scope of the problem to be addressed. If the scope is too narrow the problem solving exercise could result in small improvements when larger, broader improvements are needed. Adversely, defining the problem with too broad of a scope could extend the time required to resolve a problem and generate solutions that might not fit the corporate culture or align with corporate strategy and never be carried out. When you take the time to clearly define the problem up front, it often saves time and makes solving the problem easier. Next the team leader or facilitator should ask “Why” the problem or failure mode occurred. The responses must be backed by facts or data and not based on an emotional response. The responses should also focus on process or systems errors. The facilitator should then ask the team if the identified causes were corrected, could the failure mode or problem still occur. If the answer is yes, then move on to the second “Why” and then the third, fourth, fifth and so on until the answer is no. Note: It is not always necessary to ask “Why” five times. The root cause could be identified during the third or fourth “Why”. It may also take more than five times to get through the symptoms of the problem and down to the root cause. In addition, by the 3rd, 4th, or 5th “Why”, you may likely discover a systemic or management practice as the cause. Upon determination of the root cause(s), a list of appropriate corrective actions should be developed to address each root cause. 5 How is a useful method of brainstorming resolutions to the root causes and developing action items to resolve the problem. The facilitator should ask the 5 Hows related to the issue at hand. How can this cause be prevented or detected? Keep asking “How” until you get to the root solution that resolves the root cause. The actions should have an owner and a due date. Regular meetings should be held to update the team on the status of the actions until all are completed. Upon completion of the recommended actions, the effectiveness of the actions should be determined. The process could be monitored and measured using Statistical Process Control (SPC), Part inspection or other methods to validate effectiveness of any improvements. There are various formats used to document the 5 Why exercise, some more detailed than others. The following is an example of the basic 5 why process. Problem statement – An operator fell and was injured during the first shift start up. Why? There was an oil spill on the floor in the machining department. Why? A Seal in machine 3 deteriorated and began cracking and leaked oil. Why? The seal material was not robust to the application. Why? Lower cost seals purchased from new supplier. Why? Seal material not specified in service manuals. It is not uncommon that the problem may have more than one contributing root cause. The 5 Why progression will sometimes branch out to form more than one path. In many cases, the root cause occurs due to an ineffective detection control or systemic issue within the organization. The Three Legged 5 Why includes additional paths to determine what control or process was not in place or not effective enough to detect the failure prior to the incident. Systemic or management processes either not in place or that could have contributed to the incident are also reviewed. The 5 Why / 5 How method is one of several Root Cause Analysis (RCA) tools available for use in problem solving and continuous improvement activities. 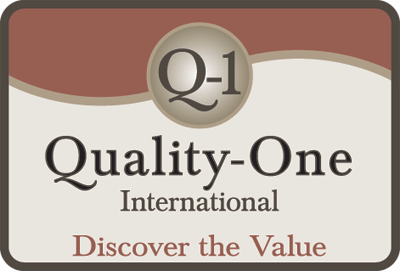 If you would like additional information about the 5 Why / 5 How method or other RCA tools, please contact one of our highly trained and experienced professionals at Quality-One. Your success is our business!